Good with children and so much fun to hug, Mastiffs were once war dogs. Now, they make loveable, docile house dogs. Sure, they may drool a little (or a lot!) but they make amazing companions and are fun to go for walks with.As they are giant breed dogs, they need special nutrients in regulated quantities both as puppies and once they are grown. But be aware — more isn’t always better, and we’ll discuss this in a moment with relation to calcium. So how do we choose the best dog food for Mastiffs? Wet Mastiff Dog Food, or Dry? What Brands Make Mastiff Dog Food? How much exercise does my Mastiff puppy need? Our gentle giants deserve dinners that will look after not only their taste buds but their health too. And, as such, there are special requirements for giant breed dog foods, as per the Association of American Feed Control Officials (AAFCO). What’s special about Mastiff puppy food? First, the AAFCO recognizes that giant breeds are more prone than smaller dogs to developing uncomfortable, and sometimes painful, joint problems. All giant foods should feature glucosamine, which — along with the right amount of doggy exercise — helps to combat the common joint complications of dysplasia and arthritis. 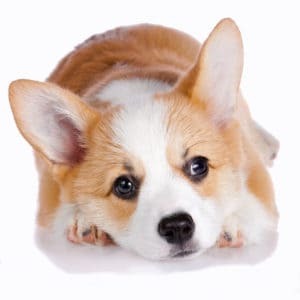 Second, unless it explicitly states otherwise, an ‘All Life Stages’ puppy food won’t necessarily have the right amount of calcium for your dog. 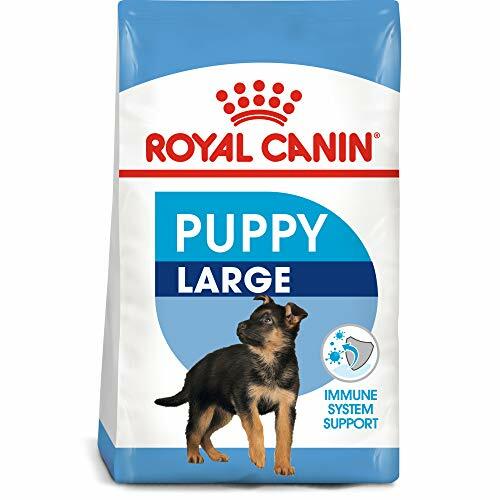 An excess of this nutrient can contribute toward the joint problems we mentioned above, so it is safer to choose a specially formulated food for giant breed puppies. Specific things that you’ll find in the best dog food for Mastiffs (and pups!) include adequate protein, not too much fat, joint-protective glucosamine, and a healthy calcium-phosphorus ratio. All giant breed dogs should be on puppy food until they’re fully grown. Typically, as an owner, you’ll notice that this may take place when your Mastiff is between a year and 24 months grown. 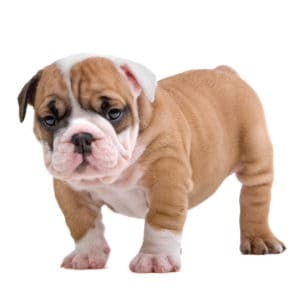 At this stage, he or she will have reached a full adult height at the withers of between 30 inches for males, or 28 inches if your dog’s a female. ALL Mastiff dog food should feature good-quality meat. Because our beloved giants deserve to eat healthily! That means as little ‘by-product’ content as possible, and try to steer as much away from synthetic preservatives as you can. Dog foods, in general, will range quite a lot in terms of ingredient quality, with some more premium brands even offering human-grade meat. In general, however, it’s hard to go wrong with real ingredients such as fish, lamb, venison, and of course, chicken! Because a pup’s calorie requirements will depend on their weight and age, you can try our Dog Food Calorie calculator for a rough estimate of daily k/Cal. If you only ever ate dried food, you’d probably get pretty bored. And as long-time dog lovers, we’re pretty sure our pets love a bit of variety, too! 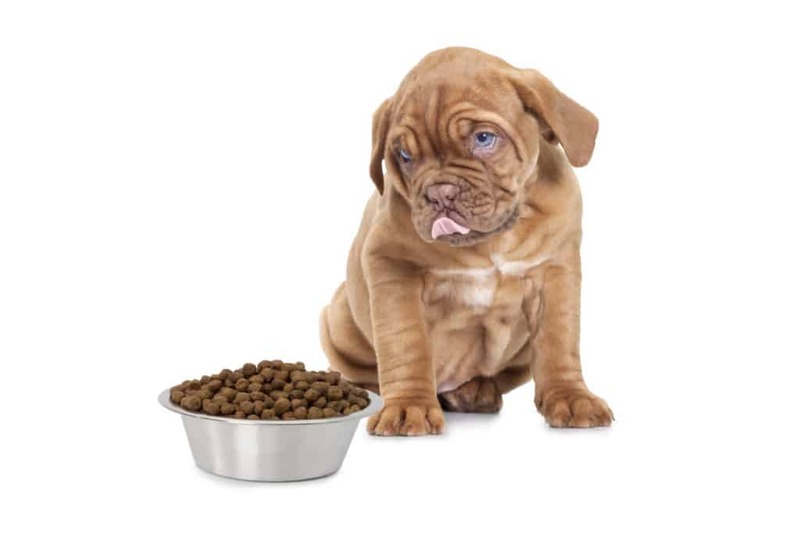 While there’s no set ‘amount’ of wet or dried Mastiff Dog Food that you should be feeding your pup, there are pros and cons of each that you may already be familiar with. If you want to keep your costs relatively low — maybe you’ve got several hungry Mastiffs! — then kibble can be quite affordable compared to cans. It lasts for quite a while both opened and sealed, so that can also be a benefit if you want to stock up. On the other paw, canned food is richer in moisture, and this comes in handy if the weather or heat means your pup needs more hydration. It’s also great for puppies who are first becoming accustomed to solid food but are ready to move on from formula or milk. So, the choice is yours — or, combine the two together for a slightly crunchy, slightly soft variety. Nice! Holistic Select – This is a WellPet brand, the name behind the perhaps better-known Wellness. You will find not only grain-free options in their ranges but also healthy natural fiber sources such as oatmeal for smooth digestion. Royal Canin – An international brand with a reliable reputation, Royal Canin has been around for fifty plus years. Founded by a vet, it’s now developed by nutritionists and produced under high safety and quality standards. 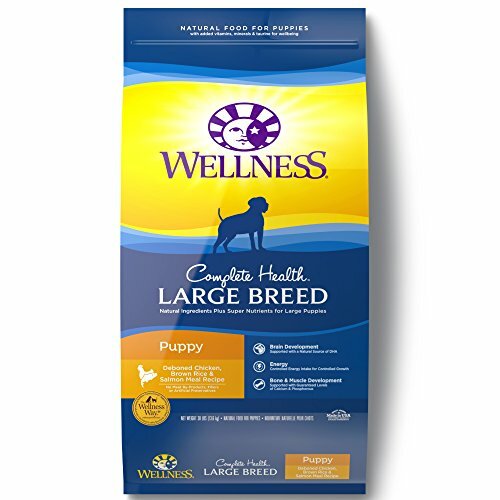 Wellness – Your giant breed Mastiff can enjoy gluten-free classic recipes when you choose Wellness, and the brand itself is such a hit with owners. For good reason, too, you’ll find something for every breed with Wellness! Merrick – You’ll find grain-free wet and dry options from this USA-based manufacturer, with instantly recognizable ingredients in every packet. Lots and lots of varied flavors are to be found for your puppy and dog with Merrick! 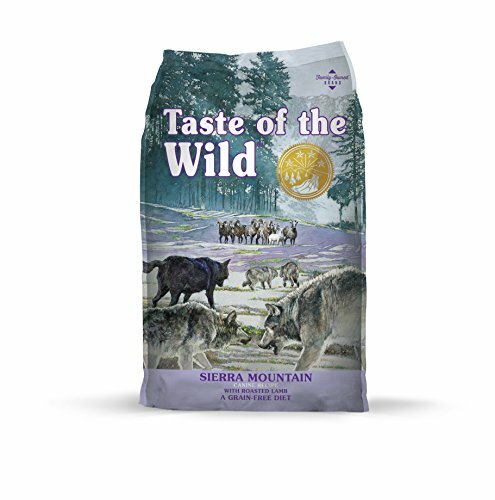 Taste Of The Wild – All dog food from this brand is made using top-quality ingredients, and all of it has real animal meat atop the ingredients list. Besides excellent Mastiff food, you’ll easily something for your Labrador, Husky, Yorkie…you get the idea! Nutrisource – Minnesota-based Nutrisource makes all their food in the US. It makes some of the best food for Mastiff puppies thanks to its use of varied protein sources and easily digestible formulas. With our gorgeous pup’s requirements in mind, let’s check out some of the best puppy food for Mastiffs! A USA-made lamb dinner for our Mastiff puppies! Featuring DHA that aids in cerebral development (for smart pups!) and no wheat. It has got zero synthetic fillers, flavors, or coloring agents. Puppies on totally grain-free meal plans will need to try a different Mastiff puppy food, we’re afraid! 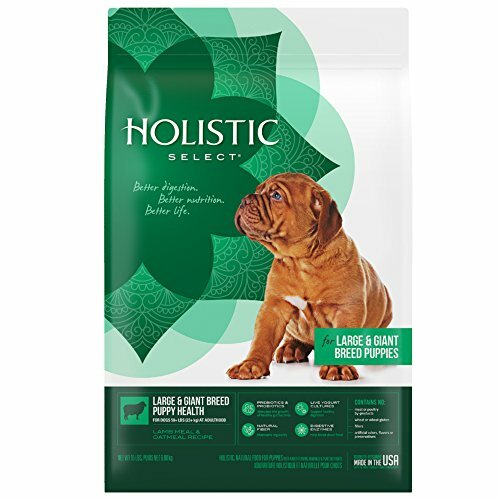 Big dogs eat a lot, but at this economical price, there’s no need to get overly worried — that’s a good deal for a healthy product from a recognized brand like Holistic Select. With L-Carnitine added for those muscles, it’s great for our gentle giants. You may know this Royal Canin dinner by its older name: Maxi Puppy. The formula is scientifically developed to meet the nutrient requirements of our beautiful, growing giants. Includes Vitamin E, a healthy way to keep your Mastiff puppy’s skin in good condition. Contains some by-products from chicken, unfortunately. If you’re looking for something that definitely ticks all the dietary requirements for your giant breed, this Mastiff puppy food has got the glucosamine and also chondroitin he’ll need. Together, these give your canine companion a much better chance at avoiding hip dysplasia. As always with Wellness, you’ll find only high-caliber and natural ingredients in this salmon and chicken formula. With no included grains! DHA aids your puppy’s sharp eyesight and equally sharp neural functioning! Gives your not-so-little one 29% protein! Grain-intolerant dogs won’t be able to eat this. There are sufficient leafy greens for protein in here, plus beta-carotene-rich carrots for A vitamins. Along with carrots, salmon oil, and all the healthy nutrients we’d expect in the best food for Mastiff puppies! 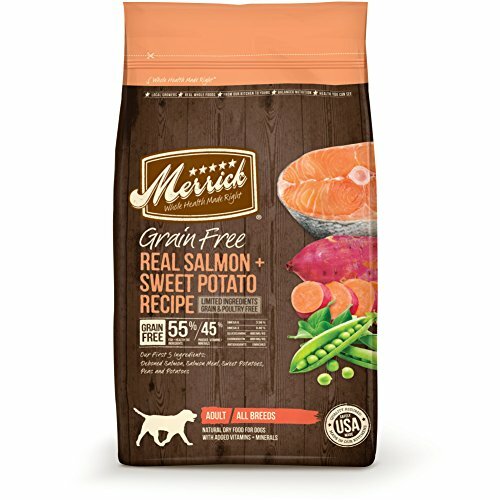 Merrick Grain Free Salmon & Sweet Potato Dry Dog Food, 4 Lb. Giant Mastiffs with gluten intolerances can savor this grain-free, chicken-free dinner with no nasty side-effects. Salmon is #1 on our ingredients list here, and it features joint- and hip-healthy glucosamine. Omegas 3 and 6 help keep those lovely Mastiff coats looking great. Not really! It’s USA-made, too! Grain-free and deliciously novel for Mastiffs who are accustomed to poultry ingredients. And, it has no milled by-products, which we love! Lean lamb protein is on your Mastiff’s menu with this delectable Taste of the Wild dinner. Contains no corn or soy, no wheat, or synthetic coloring agents. Roasted lamb is the very top ingredient — now that’s classy! Alternative proteins are also included, such as eggs and peas. Nope, this is AAFCO-approved for our beloved giant breeds. It’s super-important for giant breed owners to ensure that the food we choose is developed for the needs of our Mastiffs and similar. This is AAFCO-certified for dogs who are expected to grow over 70 pounds. Plus, it sounds delicious! 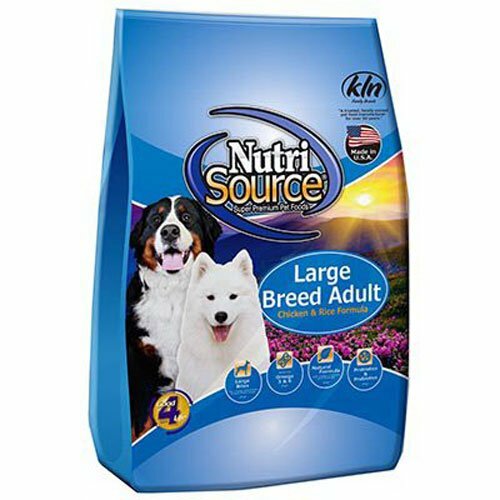 Suited for grown-up dogs over 50 pounds in size, this contains carefully balanced amounts of phosphorus and calcium. So, not too much, not too little. Plus, it uses ethical chicken ingredients! All the lovely vitamins and minerals you’d expect from an internationally respected manufacturer. It contains some white rice, which some owners may choose to avoid. Formulated with healthy supplements to meet all your best friend’s requirements, and it gives your dog a nice selection of different animal proteins. Unless you’ve got a gluten-intolerant pooch, this is a five-star option. On all the best dog food for Mastiffs, you’ll see that little disclaimer “with adequate exercise…”. What an adequate amount of exercise means will vary depending on your puppy’s life stage. Puppies will generally get enough exercise on their own, provided you give them enough space to do so. This means that if you have a large yard and it is possible to do so, let your Mastiff puppy run around at his leisure. You may want to consider a wireless dog fence, but it’s never a good idea to leave your Mastiff tethered if you can avoid it. If you haven’t got a yard, it might help to take your puppy to the park for 30-40 minutes each day, twice daily. This way, when he’s tired, he can stop playing by himself and rest. You should try to avoid overly vigorous exercise for these soon-to-be giants because their joints and bones are not yet fully developed. Giant breeds are somewhat more prone to developing hip dysplasia than some other dog breed sizes. This is a condition in which their femurs — bones in their thighs — are not completely covered by their hip sockets. It is often inherited but can be made worse through poor nutrition. To help your Mastiff avoid hip dysplasia, it’s important to ensure that he’s getting the right amounts of exercise and glucosamine. You’ll find glucosamine in the best dog food for Mastiffs and puppies, as it will have been specially developed with their needs in mind.